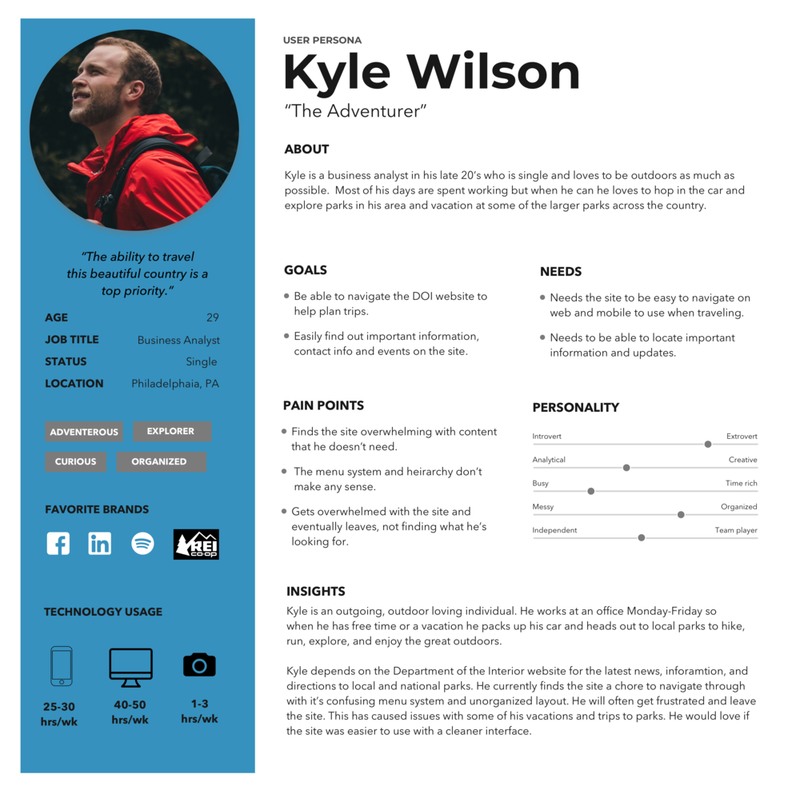 Over the course of two weeks I was challenged to review the current website and branding of the US Department of the Interior, analyze the user experience and the UI elements, address their strengths and weaknesses and develop a solution that makes the site more modern and efficient by updating their Style Guide. The Department of the Interior manages and conserves our nation's natural resources and cultural heritage and serves as a major gateway of information for millions of visitors each year. It is vital that the user experience efficiently serves everyone from visitors planning to visit one of our national parks to employees signing in to manage work accounts. Before starting in on this project I was familiar with aspects of the Department, but not it's entirety. I took time working through the site, breaking down all of its pages, features, and resources via a sitemap and analysis with another designer to make sure we understood the depth and breadth of what the department does. Ultimately, this helped me organize the content and offered a better understanding of the areas the Department covers as well as structure a hierarchy of what content takes priority. Without this initial organization and information, it would have been impossible to fully approach this redesign and create a solution that was helpful to those who use the Department's site. In addition to the site map and analysis I conducted user interviews. During the interviews I collected information from individuals who were familiar with the Department and their website and those who weren't. It was important to engage with a varied user base in order to create a solution that is clear, easy to follow, and not off-putting to any site visitor. The information gathered from these interviews revealed some common themes. More than half of the individuals interviewed did not understand the actual mission of the department and what they are chartered to do. 90% of the users who were familiar with the site said they don't use it because the organization of the navigation is confusing and it's hard to find what they are looking for. 50% of the users who were unfamiliar with the site said it felt cluttered, more like a social media page due to all of the photographs on the homepage, rather than a department site that they could use to find helpful information. Once the users were beginning to understand the layout of the site they were surprised by how much the Department does and how helpful some of the information actually would be to them on a regular basis. 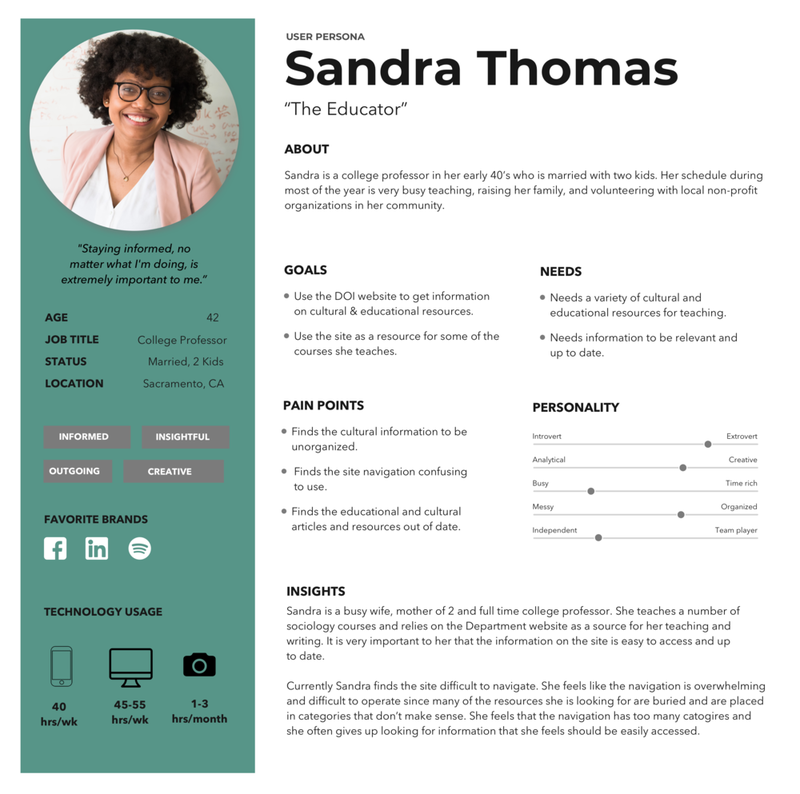 From the interviews conducted two personas, Kyle Wilson and Sandra Thomas, were created to visually represent the information and insights that were gathered. In order to create new visuals for the Department, I compiled boards in Invision to help plan out all of the necessary categories that were needed for the style guide as well as track market trends. During this phase I iterated over various design layouts, color palettes, icon sets, and typography to find the right combination. 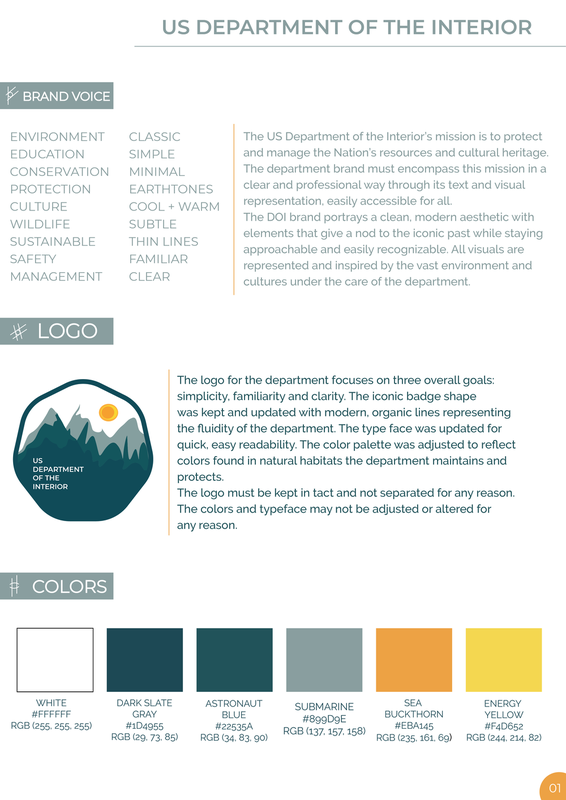 I overhauled the Style Guide for the Department of the Interior to reflect the mission and vision of the Department coupled with the information I gathered during the research phase and visually translated it screens you see here. The major categories included: Brand Voice, Logo, Color Palette, Typography, UI Elements, Photography, Social Media, and Navigation. My goal was to embolden the voice of the Department and pair it with modern UI elements, a brand new logo, and a color palette that reflects the strong, natural elements the Department is tasked with overseeing. 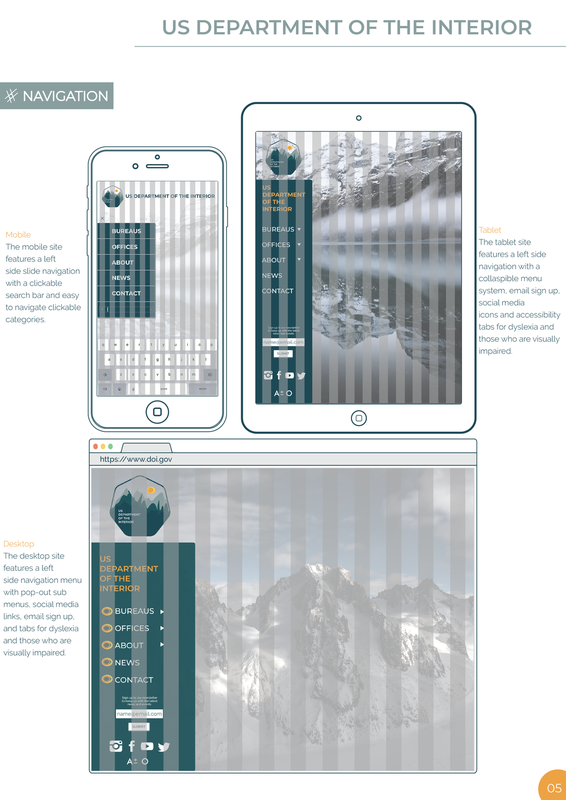 I also created a number of screens showing the new navigation on desktop, tablet, and mobile views. The challenge to reimagine and redesign the brand and website for the Department of the Interior was successfully completed with analysis, research and design iteration. The UI elements including typography, color palette, icons, logo and navigation were updated to reflect a modern aesthetic. The layout, accessibility, and brand voice were also updated making the mission and vision of the department clear and concise. Moving forward, additional user interviews and research with department employees would be helpful to continue to build out the navigation, employee portals and other areas of the site that department employees heavily depend upon.